Tag Archive | "Twin Spot Puffer"
The Target Puffer (Tetraodon leiurus) aka Twin Spot Puffer or Eyespot puffer, is found in both flowing and standing waters of the lower Mekong river region of Southeast Asia, from Thailand to Indonesia, in both freshwater and brackish environments. They have been found in the Chad basin, Niger, Volta, Gambia, Nile, Geba and Sénégal Rivers. 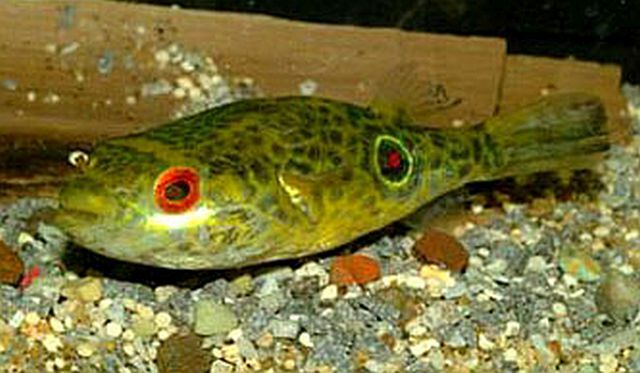 The Target Puffer (Tetraodon leiurus) is commonly misidentified as the Thai Puffer (Tetraodon barbatus). Tetraodon Leiurus has eyes with a silver sheen like appearance for irises that are outlined in red. In addition there is a colored eye spot near their tail which can range in color from an orange to purplish color. 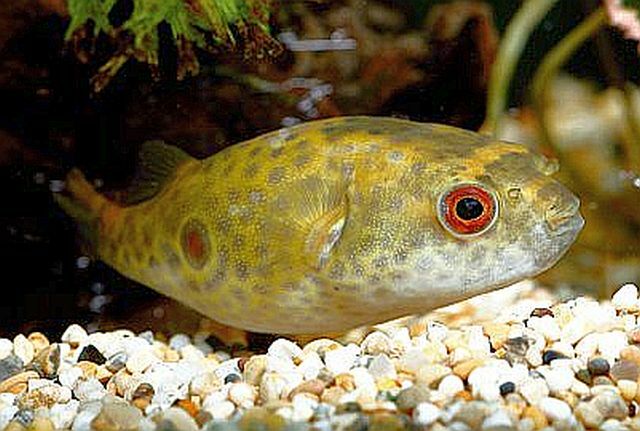 The Thai Puffer (Tetraodon barbatus) is similar but lacking in color. Both the Target Puffer (Tetraodon leiurus) and Thai Puffer (Tetraodon barbatus) are highly aggressive fish that are best housed in a single species tank or if need be, with fast swimming fish that stay to themselves. They are notorious fin nippers. The Target Puffer does best in a densely planted aquarium with a sandy or very fine gravel substrate aquascaped with some pebbles and driftwood roots for them to hide among. Like all puffers, the Target Puffer is a messy eater and susceptible to changes in water quality. They need to be provided with highly filtered water without too much current. Target Puffers are easy to feed and will accept live ghost shrimp , snails, and frozen or freeze dried krill, clam, shrimp, crab legs and other molluscs from the fresh seafood counter. Like most other puffers,they should be fed a steady diet of hard shelled foods to prevent their fused from overgrowing. The Target Puffer is considered rare among tropical fish keeping enthusiasts but juveniles and young adults are sometimes available from specialty fish shops at around 2″ in size.